The State has identified the southern half of Stockton as disadvantaged due to a disproportionate exposure to pollution. 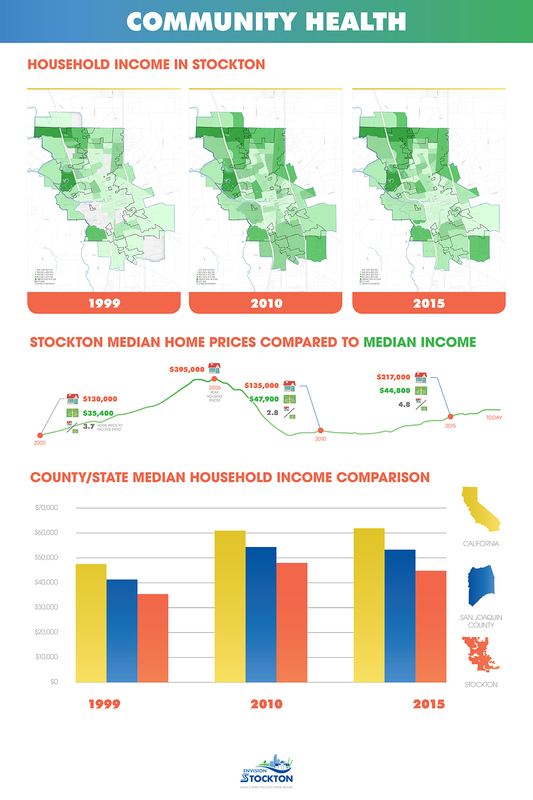 Average wages in Stockton are below those in the county and state. 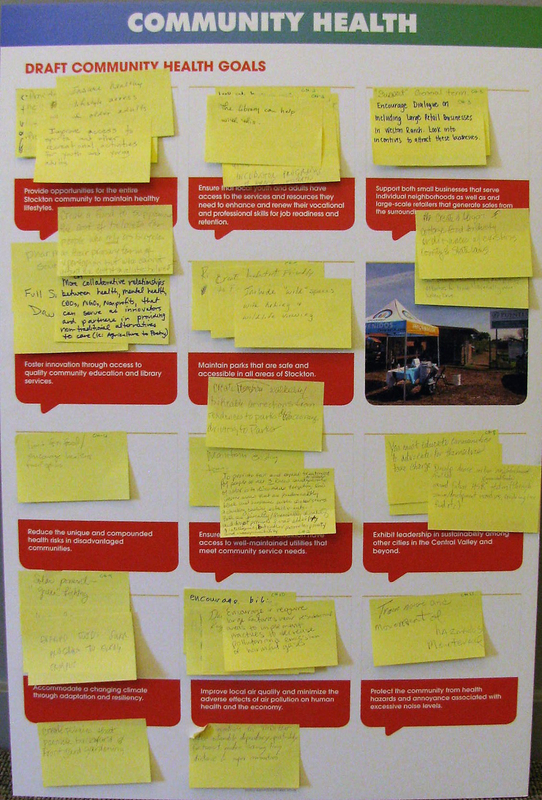 Comments made at the May 1st and 2nd open houses related to community health. Provide opportunities for the entire Stockton community to maintain healthy lifestyles. Ensure that local youth and adults have access to the services and resources they need to enhance and renew their vocational and professional skills for job readiness and retention. Support both small businesses that serve individual neighborhoods as well as and large-scale retailers that generate sales from the surrounding region. Foster innovation through access to quality community education and library services. Maintain parks that are safe and accessible in all areas of Stockton. Reduce the unique and compounded health risks in disadvantaged communities. Ensure that all areas of Stockton have access to well-maintained utilities that meet community service needs. Exhibit leadership in sustainability among other cities in the Central Valley and beyond. Accommodate a changing climate through adaptation and resiliency. 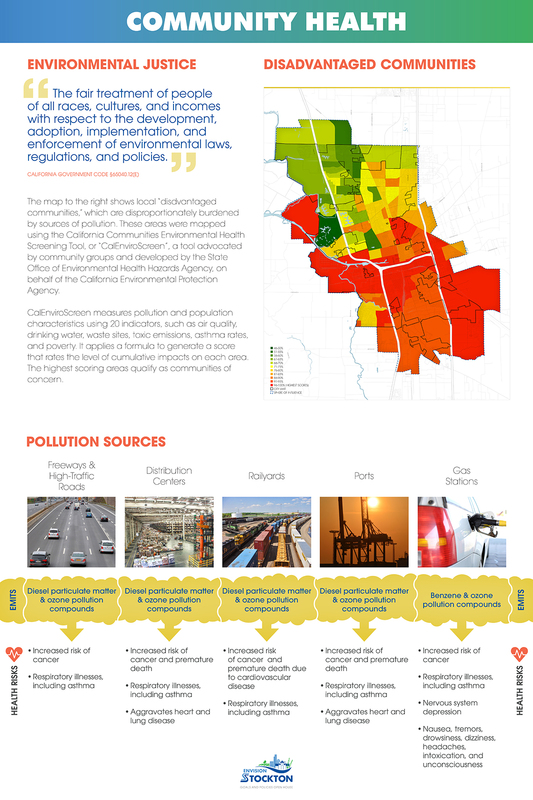 Improve local air quality and minimize the adverse effects of air pollution on human health and the economy. Protect the community from health hazards and annoyance associated with excessive noise levels.